Owing to the huge size of tank(6 mtr dia X 6 mtr height) D M engineering had suggested to manufacture this 165 KL HCL tank at site. a temporary shed was erected near the instillation site. a team of 20 technicians was deployed and the site fabrication was finished in record time of 2 months. the tank is now in service for more than 8 years without any defect giving trouble free storage of 33% HCL acid. 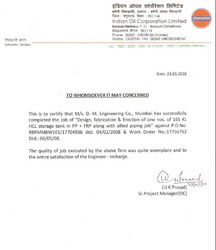 as a result, in 2012, DM engineering is awarded with repeat order for site fabrication of another 165 KL HCL storage tank & allied HDPE piping by IOCL Barauni. this order too was completed in record time and is also giving leak free service since 2012.